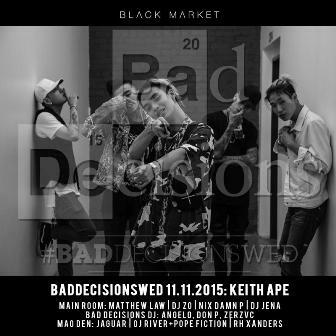 Why you should go: Catch Keith Ape with DJ Zo, Nix Damn P, DJ Jena, Angelo, Don P, and Zerzvc in the Main Room and party with Jaguar, Oj River, Pope Fiction, and Rh Xanders in the Mao Den. 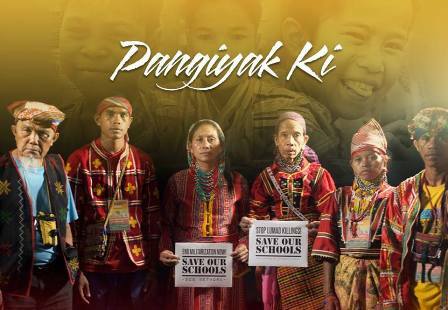 Why you should go: Manilakbayan ng Mindanao and the Save Our Schools Network will hold a benefit concert for the Lumad schools of Mindanao entitled “Pangiyak Ki!” (Manobo term for Shout Out!) where local, national and international artists, musicians, advocates and support groups will unite for their cause. This benefit concert will focus on raising awareness and support for the Save Our Schools campaign and act as a fundraising drive to provide materials for the Lumad schools. Other details: Event starts at 7 p.m. No entrance fee but donations are welcome. Why you should go: Fresh Filter is back and they're bringing you a fresh lineup at a new venue! 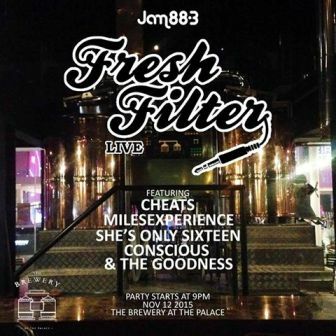 Join them for a free show at The Brewery with Cheats, She’s Only Sixteen, Conscious & The Goodness, and Miles Experience. Other details: Gig starts at 9 p.m. Free entrance! 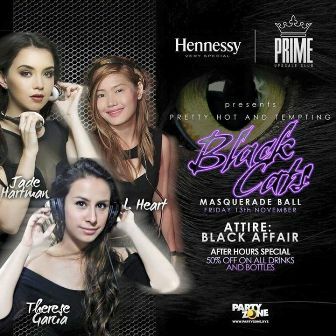 Why you should go: Get lucky this Friday the 13th and party with DJs Jade Hartman, L Heart, and Therese Garcia. There will also be an after-hours special on drinks: 50% off on all drinks and bottles. Don’t forget the black dress code! Other details: Gates open at 9 p.m. For inquiries and table reservations, contact 0915-111-8103. Other details: Event starts at 9 p.m. Limited free invites! Sign up here. 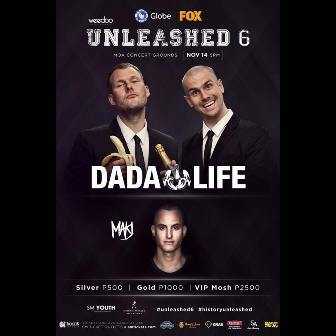 Why you should go: Get ready to see two international acts at the latest installment of Unleashed: DJ Mak J and Dada Life. Sharing the stage with them are Katsy Lee vs Kat DJ, Marc Marasigan vs Travis Monsod, Nix Damn P vs Carlo Atendido, Mars Miranda vs Ace Ramos, plus Ron Thug and MC Pao! Other details: Gates open at 5 p.m. Tickets range from P500 to P2,500 and they are available in SM Ticket Outlets and online. 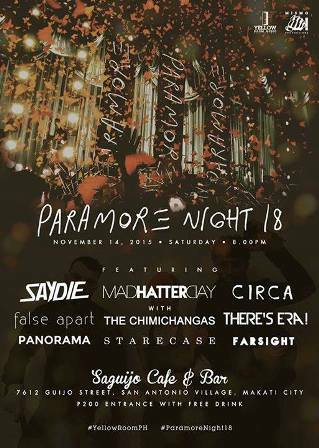 Why you should go: It’s another Paramore night with covers courtesy of Circa, False Apart, Farsight, Mad Hatter Day featuring The Chimichangas, Panorama, Saydie, Starecase, and There’s Era. 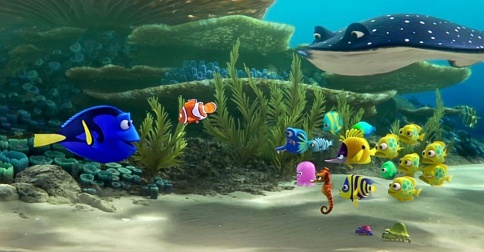 Why you should go: Get a hold of Oh! Flamingo’s EP and listen to their latest tracks. 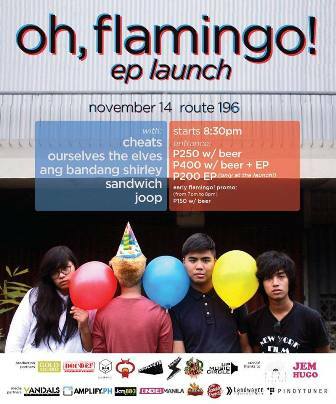 Supporting acts include Ang Bandang Shirley, Ourselves the Elves, Sandwich, Cheats, and Joop. Their EP is also available at the venue for P200. 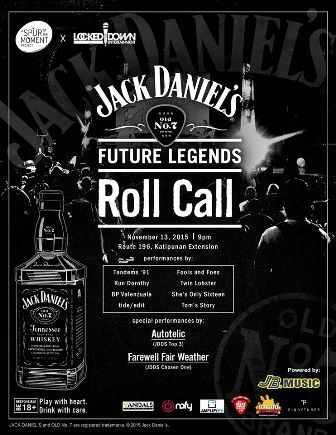 Other details: Gig starts at 8:30 p.m. Get in for P250, inclusive of one beer. Or you can pay P400 to get in, get a free beer, and your own copy of the EP. If you come between 7 p.m. and 8:30 p.m., entrance is P150 inclusive of one beer. 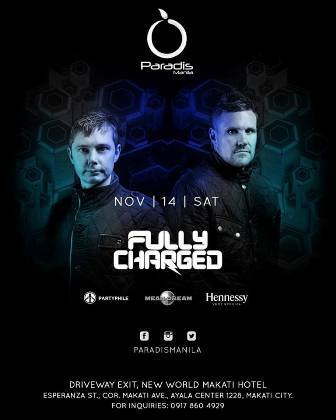 Why you should go: Party with a well-loved DJ duo in the UK, Fully Charged, this Saturday at Paradis Manila. Other details: Be there by 10 p.m. For table reservations or to be on the guest list, contact 0917-860-4929. 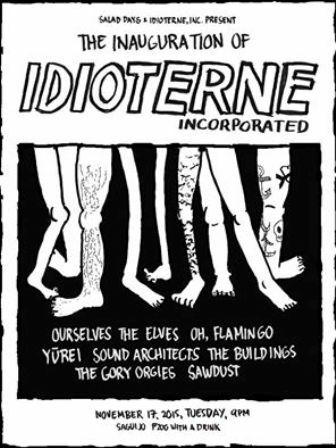 The Inauguration of Idioterne Inc.
Why you should go: Spend Tuesday night rocking to Sawdust, Sound Architects, Oh, Flamingo, Ourselves the Elves, Yūrei, The Buildings, and The Gory Orgies.